Examining the history of education in this country, Dr. Paul identifies where we've gone wrong, what we can do about it, and how we can change the way we think about education in order to provide a brighter future for Americans. Twelve-term Texas Congressman, Presidential candidate, and #1 New York Times bestselling author Ron Paul returns with a highly provocative treatise about how we need to fundamentally change the way we think about America's broken education system in order to fix it. Whether or not you have children, you know that education is vital to the prosperity and future of our society. Yet our current system simply doesn't work. Parents feel increasingly powerless, and nearly half of Americans give our schools a grade of "C". 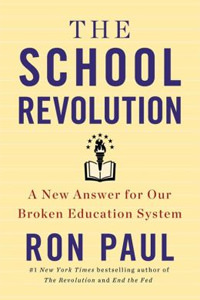 Now, in his new book, Ron Paul attacks the problem head-on and provides a focused solution that centers on strong support for home schooling and the application of free market principles to the American education system. Examining the history of education in this country, Dr. Paul identifies where we've gone wrong, what we can do about it, and how we can change the way we think about education in order to provide a brighter future for Americans. First appeared in 1965 and was immediately hailed as one of the century's most important works on education. There is no way such a lecture series could appear on a campus of this sort today. These posters, featuring the "giants" and their greatest works, can be a great conversation-starter for your dorm, apartment, office or study. Can we recognize tyranny when it is sold to us disguised as a form of liberty? This book helps you protect—or restore—your child's natural curiosity, making learning once again a joyful and exciting experience.